When Winnie complains that all her friends have monsters, after some convincing, her Papa finally agrees to let her have one. But life with a monster is not always easy, as Winnie soon finds out when he goes swimming in the toilet, eats Papa's cell phone, and NEVER sleeps. Winnie must quickly learn how to train her monster so he's not constantly misbehaving or else she might soon find herself monsterless. What made this book stand out in the humor department was all the little cheeky details that Gravel included like the fact that Winnie, our protagonist, has a poster of The Cranky Ballerina (One of Gravel's other more recent picture books) as well as some pictures of characters from some of Gravel's other books, the fact that the dad is carrying around a book that says "The Art of Zen" on the cover when their monster is being particularly ornery, and how when the monster finally does calm down, he's intently reading a book upside down. 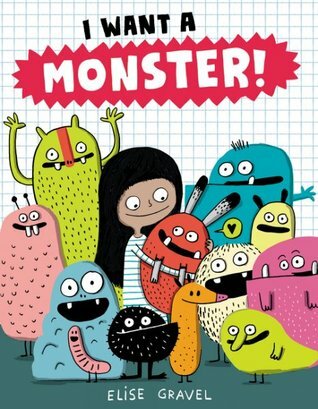 Also, what will make this a fabulous book to read aloud to kids is the activity Gravel includes at the end for kids to create their own monster. I will be for sure doing a monster-creation activity with my students in the library in the near future.